This walk: 2013-7-31. A damp, misty walk: saw mill leat, hut circle, ponies, River Erme, Downing's House, dam, Pile's Copse. Leat at the uphill edge of the car park at New Waste: this appears on the map to derive from Redaven Lake and runs along the edge of Grange Plantation through Brook Barn and New Barn to the Saw Mill near Blatchford and the Deer Park on the edge of Cornwood. 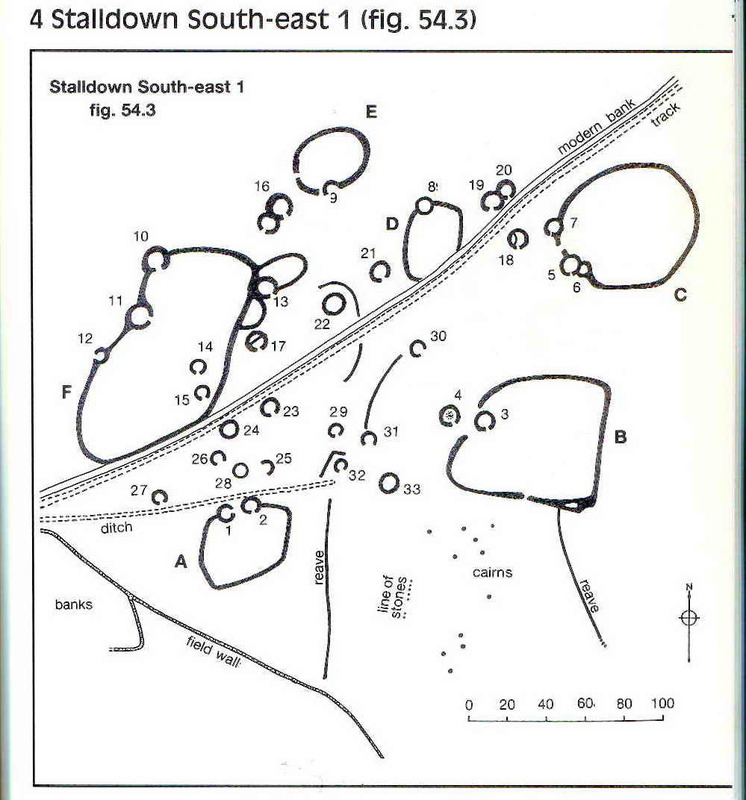 This area has one of the largest settlements in the Erme valley, being about 1 km in extent, and described in detail by J. Butler (1993), Dartmoor Atlas of Antiquities IV, The South East. 54.4 Stalldown South-east 1 (fig. 54.3, pages 41-42). Ponies taking shelter where they can find it from some fairly unpleasant weather. A view of the River Erme, after the mist cleared temporarily. Downing's House, SX 63940 62928: this is an old tinner's hut, from the day's of tin streaming, situated beside Downing's Brook. Eric Hemery (1983), High Dartmoor, Robert Hale, London, page 251. A reservoir tank with a valve that must go down to a pipe ..... the pipe presumably goes around the hill to the water treatment works that then supplies Cornwood and surrounding hamlets. A contact in SWW has given me this sentence: � Water is abstracted from the river at the intake we saw at the end of the track. The water is transferred by pipe to a Water Treatment Works near Totnes which supplies South Devon in conjunction with other sources in the area (eg Avon, Venford, River Dart)�. Looking up-river from below the dam. A view of the trees across the valley in Piles Copse ..... still quite misty. 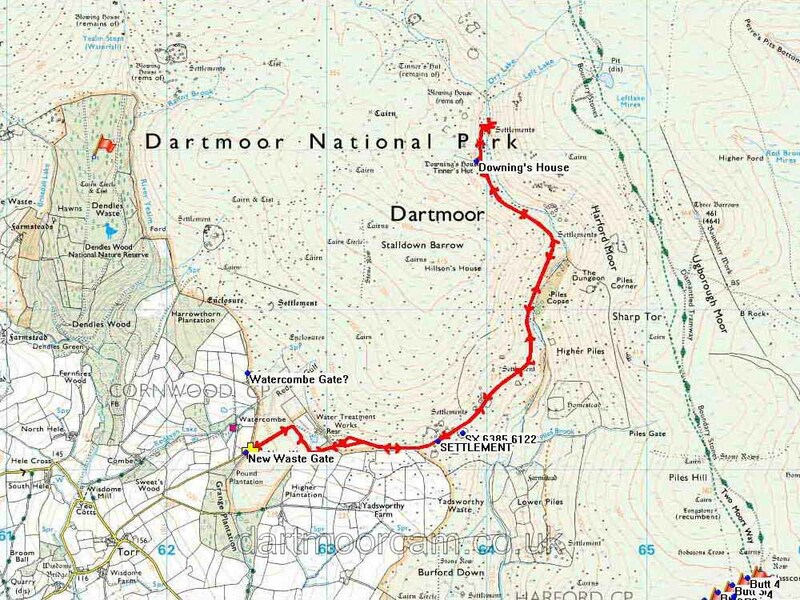 This walk was reached via Cornwood, heading north-east from the village square, taking the third road on the left, at Torr. Ignore a small green lane shortly following the first road on the left. Then immediately right, finally bearing left to the car park at the yellow cross symbol on the map above.